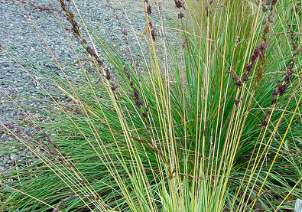 A purely awesome form of Moor grass that we find indispensable at Xera. A strongly clump forming grass that has comparatively wide leaf blades margined heavily in cream. The effect up close is alternative deep green and yellow/cream vertical stripes. Very handsome. In summer 2′ spike rise. The stems are the exact color of yellow/cream that appears on the leaves, it gives great continuity to the whole plant. At the tips of these bright vertical stems are deep tan inflorescences. Exciting. Forms a clump to 18″ wide fairly quickly. Responds best to enriched soil that is fertile, drains well and light, consistent summer water which will lead to a much less thirsty plant in the long run. Roots go down very very far, and an established clump is somewhat difficult to lift and divide. But it can go many, many years before this is needed. Completely winter deciduous- cut back the vertical stems any time it is dormant. A fine texture for great contrast in borders or massed. Long lived and very hardy grass.